Previous posts (A, B, C) discussed the pros and cons of digital versus print books. A survey of students by Bowker Market Research (June 11, 2013) indicates that only 3% of college students in the previous semester used a digital textbook as their main course material. Publishing Business Today (Jan 21, 2015) confirms the student preference of print books over ebooks. The Bowker survey of 1,540 undergraduate college students found that students overwhelmingly prefer print, at both four-year and two-year institutions of higher education. The reasons include students preferring “the look and feel of print,” the greater ease in highlighting and note-taking, and the fact that they can’t re-sell digital textbooks. Among those few students who prefer digital textbooks, the reasons include price, ability to search the text, and ease in carrying around. The topic continues to evolve. We welcome your continuing thoughts on the use of ebooks in medical student education. In the meantime, Medmaster is working on the best ways to present its books in both print and ebook formats. Previous posts discussed the pros and cons of print books versus ebooks. This post discusses the pros and cons of the various eReading devices and eReading apps. Which tablet (or computer) should you use to read ebooks? Which reading apps? Choosing the best way to read ebooks can be confusing. There are many different reading tablets. Some ereading apps work with some tablets and not others. There is also the growing ability to read books directly from the web, whether from a tablet or a computer. While it may seem obvious that publishing companies should simply list all their books on every eBookstore (e.g. Amazon, Barnes & Noble, etc. ), it is not that simple. 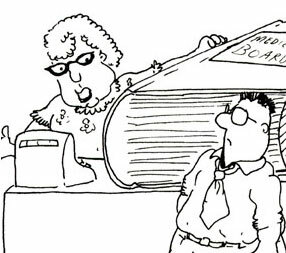 The particular ebookstore’s terms to a publisher may differ depending on the size of the publisher and the price of the book. Thus, a publisher may opt to place certain titles in only certain ebookstores. Also, some books do not presently lend themselves well to ebook format. Buying print books is relatively simple: buy them any place; no need to distinguish between reading tablets, apps or booksellers. For ebooks, though,with time-consuming usernames, passwords, and wrestling with computers, mobile devices, and reading apps, it is a wonder that a medical student can get any reading done at all. Time is at a premium for medical students, and we need the most efficient ways to read. I still prefer print books. But others prefer ebooks for their ease of acquisition, portability, searchability, hyperlinking and multimedia capability, and generally less cost than print books. If you want to read using an ebook, which is the best tablet to purchase, and which ebookstores and reading apps should you use? I have summarized my current understanding of the matter in the chart below, along with some general observations that follow. 1. Of all the tablets, only the iPad supports reader apps from the all the various ebookstores (iBooks, Nook, Kindle, etc.). I suspect that is because Apple, although having its own ebookstore, is mainly interested in selling iPads and wants its readers to know that with a single iPad they can read any ebookstore’s books. On the other hand, Nook (Barnes & Noble) and Kindle (Amazon) are mainly bookstores, and are more resistant to having other eBookstore apps on their tablets. Thus, their tablets do not support the broad range of reading apps as the iPad. It is interesting that while the iPad has its own iBookstore, you cannot read iBookstore books on a Macintosh computer (! ), or for that matter on any other tablet or computer. So if you want to read books from Apple’s iBookstore, you presently need an iPad. 2. Medical students’ needs differ from that of the general public in that medical students, in addition to studying a lot, commonly want to highlight, and to a lesser degree take notes when reading. I found highlighting more awkward on the Nook tablet than on iPad, Kindle, or Android. While the Nook tablet otherwise has excellent reading features, its somewhat awkward highlighting and lack of support for reading apps other than its own is a drawback. While the Nook app for Windows Vista works well, it appears the Nook for Windows 8 does not presently have a highlighting or notes feature. I found Nook for Macintosh buggy in that sometimes its menu does not appear when the application is opened. 3. In contrast to tablets, it seems easier and quicker to highlight using a computer, whether Mac or Windows, using a mouse or trackpad. The availability of relatively large monitors for Mac or Windows computers makes them easier to study from than the smaller monitors of mobile devices. And the external keyboards of Mac and Windows computers make typing, as for notes and other functions, quicker than on a tablet. 4. There is an increasing ability to read books on the web. Kindle, in addition to its reading app for computers and tablets, also allows reading directly from the web via its Kindle Cloud Reader, which makes it easier for the student to log in anywhere, even without a tablet or a computer that has the Kindle app. Kindle Cloud Reader has good highlighting and note-taking ability. Google Play, Inkling and Vitalsource (VS) also have tablet readers as well as web-reading functionality with good highlighting and note-taking. Nook for web allows direct reading from the web, but at this time it does not appear to support highlighting or note-taking. Of course, the drawback of relying on the web to read is that the web may be down, or you may be out of range of wi-fi. 5. In addition to the specific ebookstores, such as Apple’s iBooks, Barnes & Noble’s Nook, and Amazon’s Kindle, there are also many independent bookstores that have their own reading apps (help! ), or whose books readers can access with what I will call “generic” readers. Two of the best generics are Adobe Digital Editions (ADE, especially the latest edition), for Mac and Windows computers, and BlueFire (BF) for tablets, both of which can read ePub and PDF files. There is now a Windows 8 Surface Pro tablet, which, unlike the Windows Surface RT tablet, has the full range of Windows 8 function, just like a regular Windows 8 computer. It, however, is thicker and heavier than most tablets and does not presently have a large screen. It also does not support the full range of reading apps as the iPad. The bottom line: I suggest that the student, where possible, use a computer (Mac or Windows) for ereading because of the easier ability to highlight, the larger monitors, and the greater ease in typing on an external computer keyboard. But if you want to use a tablet, the iPad offers the greatest range of ebookstores to choose from, good highlighting and note taking features, and an intuitive interface. The field of ebooks is changing rapidly and these opinions may change as well. What do you think? Since so much of medical education involves reading, it is important to consider how eBooks compare with print books. Pros and cons of either method of reading have been presented in previous posts (A, B, C). Which format do medical students prefer? Comparing medical student needs with those of general readers in other areas of interest is not necessarily useful. Someone reading a novel may have different preferences than a student who wants to underline, take notes, and study intensively for long periods. The impression I have from medical students is that preferences differ considerably. Some prefer eBooks because they are easily portable and generally cost less than print books. Also, it is easier to acquire eBooks outside the country of publication, due to high costs of shipping print books. Ebooks also have an advantage of easy searchability and the ability to link to other areas. They can provide audio and video and are more easily updated. Other students, however, prefer print books. Not every book requires audio and video. While an eBook can provide an impressive 3D rotation of the complex hemoglobin molecule, how important is it to know this structure? Is it educational or eye candy? While current eBooks allow for highlighting and note-taking, it is easier to do this directly in a print book, and one can easily just flip from one page to the next. Also, the screen glare is disturbing to some; it can be fatiguing looking at a screen for a long time, and there is a question as to whether reading speed and retention may be superior in print books. There is also an intangible; there is something “cozy” about a print book that is not found in an eBook. In view of the differences in preferences, it would make sense for a publisher to publish the same book in both print and eBook format, so that readers can decide for themselves. Presently, several factors delay the publishing of eBooks: One is the different formats of eBooks; an eBook may be available on one type of reading tablet but not another, and even when books are available on a number of reading tablets, the interfaces may differ and the books may look different on one tablet as compared with another. Some books can be read on one’s computer desktop; others off the Internet, while others require a reading device. Also, some companies offer books using their proprietary reading applications, which are not available on Kindle, iPad, Nook, Android, or other reading tablets. This confusion is not the case with print books, where there is a single standard format; everyone knows how to use a print book and they are simple to use. If you want a print book, you can just go to a bookstore or major Internet distributor such as amazon.com or Barnes&Noble.com to purchase it. When the format and method of distributing eBooks become more standardized, this should increase the publication of eBooks, since a publisher can then develop an eBook in a single format and have it widely available, without having to prepare the book in a number of different formats for different eReading platforms. Another factor holding up the production of eBooks is the evolving terms that eBook distributors such as amazon (Kindle), Apple (iPad), Barnes & Noble (Nook), etc. offer to publishers. These will need to be worked out and better standardized. In addition, preparing an eBook that has many images and tables, particularly tables that spread across two pages in an 8.5″ x 11″ print book presents certain technical problems in trying to convert it to an eBook, since current eReaders offer a smaller viewing area, and there can be problems with the awkward reflow of text in tables. Presently, Medmaster has begun developing a number of its titles in eBook format. These include Acid-Base, Fluids and Electrolytes Made Ridiculously Simple, The Four-Minute Neurologic Exam, Anatomy of the Soul, Med’Toons and Clinical Biostatistics Made Ridiculously Simple. 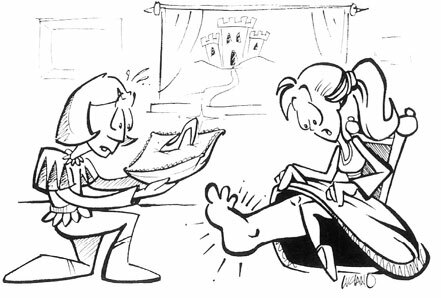 Cinderella’s untimely episode of pedal edema. Previous posts have presented the pros and cons of eBooks versus print books, with particular emphasis on the eBook needs of medical students. Another consideration has arisen. Does reading on an eBook interfere with the remembering of what was read? Some studies suggest that remembering may be harder with eBook reading (see Healthland and The eBook Skeptic) than with print books. The associations one makes with landmarks in print reading (the relative positioning the text and figures, whether the information was at the top or middle of the page, on a left or right-hand page or column, etc.) is not set with eBook reading when there is shifting of text flow with resizing of the page or font size. This relates to a memory technique called the Memory Palace (the method of loci) discussed in a previous post, where the context of the information, such as the surrounding visual landmarks, plays a role in memory ( also see Brier Dudley’s Blog). Ebooks that have text reflow have fewer such landmarks, and remembering may be more difficult. 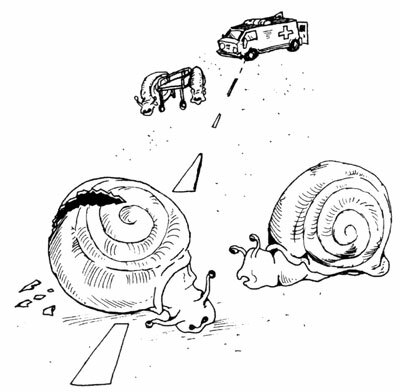 Another issue is whether reading may be slower with eBooks than print books. Some of the earlier studies suggested this, but were done years ago when the computer screen had lower resolution, so it is unclear whether this is still a source of concern. It is also a question as to whether linking all over the place slows down reading and makes it difficult for the reader to keep track of all the links. The issues of remembering and reading speed with eBooks require more study. If you have used eBooks, do you have any personal observations regarding your ability to remember, or reading speed with eBooks? Do you prefer eBooks or print books? "Easy, John, help will be here any day now." As a medical student, which do you prefer, eBooks or print books? Medical study is intense, involving a great deal of reading. Does the glare of reading on a screen for long periods outweigh the convenience of not carrying around heavy books and the generally decreased pricing of eBooks? While eBooks provide the opportunity for sound and video, many subjects do not need sound and video for effective presentation, or the sound and video could be presented as a separate program on your computer. Medmaster has done this for a number of its titles, with CDs that accompany the print books, the print books for the long stretches of reading, and the CD programs for additional interactivity. Medical study often involves a great deal of text highlighting and page turning. While you can do this with both eBooks and print books, the process seems slower with eBooks than with print books. Is this enough of a problem to lead students to still prefer print books? Another issue is the distraction that can occur when reading from an eReader. Do all the links to other areas, to YouTube, apps, games, the Web, music, and news steal time from the reading and study of the medical book, which should be the main object of focus? What is your opinion? If you have used eBooks, do you find that you prefer them to print books? Would you use both? Please send your opinion. Your feedback is important. In addition to classical print books, there now is the growing option of reading eBooks, whether on reading devices (e.g. Kindle, iPad, Nook, Android), on the Internet (e.g. Google Books), or as downloads from the Internet to your computer. • eBooks avoid the space limitations of print books. In small living quarters, it is space-saving to have books in electronic form. • It is easier to carry books in electronic format than heavy print books. • eBooks are generally less expensive than print books. • Ebooks have the potential for interactivity, including searching and hyperlinking to other sources of information, as well as audio and video enhancements. • Ebooks can be updated more frequently than print books. • While there are provisions in some eBook reading devices and applications to underline, take notes, bookmark, and jump to different areas of the book, some people may find it less awkward to do this in an actual print book. • If books are read via the Internet, the ability to read would depend on whether or not there is an Internet connection at the time. This problem does not exist in a printed book or when reading eBooks that are already downloaded to a reading device or eReader application on one’s computer. • Hand-held pocket sized devices may be convenient to carry around, but their small screens make them impractical for certain kinds of books, particularly those that have many illustrations and charts. • Many medical texts are in color. This would render it impractical to read them on a device that uses electronic ink, such a black and white Kindle. • It can be fatiguing reading a screen for extended periods. • If the eReader device only allows reading one book at a time, this may be problematical for those who want to study from more than one book simultaneously. When I was a medical student, the saying was that the highest grade would go to the student who could write the fastest, in view of the need to write down the lecture notes. Today, students can take classroom notes on a computer. A standard computer keyboard allows more rapid typing than on other devices, such as an iPad or hand-held device. While one can purchase a wireless keyboard to type on an iPad, this is an extra device to carry around. What is your preference – eBook or print book? Do the needs of medical students differ from those of other readers? What is your opinion about the future use of eBooks versus print books in medical education?